Sorry, Colonel Sanders: The Fricadelle takes it! Have you seen those commercials for the KFC bowls? You know, the ones where they serve mashed potatoes, corn, fried chicken, gravy and cheese all layered together in a big old bowl. Come on, you’ve seen them. Maybe you’ve puzzled over them like I have. Admit it: You’re strangely drawn to them and yet revolted at the same time. They are a paradox… or a conundrum… or maybe even something unholy. Why? Because all the ingredients in those bowls sound great. I love mashed potatoes. I love corn. I love fried chicken. I love gravy. I love cheese. In some circumstances, I might even combine all of these things before eating them. But there’s something about those bowls… something not quite right. Well, folks, I have the answer to those bowls for you: Don’t do it. Skip KFC and their suspicious looking “famous bowls.” Stay home, curl up and make my husband’s fricadelle instead. What is fricadelle, you ask? It is layered comfort food done right, friends. 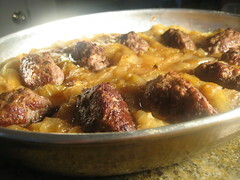 It is creamy, buttery mashed potatoes, topped with sweet and luxurious caramelized onions, and spotted with delicious, hearty, flavorful meatballs made from scratch. It is absolutely delightful and perfect for consuming on a dreary winter’s day. You like mashed potatoes? You like caramelized onions? You like meatballs? Have no fear — they are enhanced, not made disturbing, by being combined into a delicious, beautiful and hearty fricadelle. I see what the colonel was trying to do… and he just falls short. I’m sorry to say it of a military man, but it’s true. The fricadelle may have been what he was hoping to achieve, but my husband actually executes it. Every bite of this fricadelle is hearty, rustic, satisfying and most important — delicious. So, stick to fried chicken, my goateed friend: My husband has the mashed potato bowl covered. There is nothing quite like cold weather and rich hearty meals. Especially given the amount of cold we’ve had here even in DC. And quite frankly, I cringe when I see what is going on back in the Midwest — did I see something about wind chills of -50F (-45C) in Montana? Terrifying… I suspect that means you have to eat in. So you might have a little extra time to make the fricadelle. Fricadelle is just a fancy French word for meatball, or at least that is essentially what Larousse Gastronomique tells me. Typically, it is a mixture of meats (here, we use equal parts pork, veal, and beef) and in Belgium and Germany it has mostly pork. I have a couple rules about meatballs. They tend to get dry and hard. So you need to take care in what kind of meat you buy and be gentle when you cook and shape the meatballs. Even if you grind your own, it is important to ensure your meat has enough fat. You may want to add a bit of fat back if you use lean parts such as pork shoulder. If you buy ground, I suggest buying beef that is a little on the fattier side — such as 80/20 — to compensate for what will likely be leaner pork and veal. When handling ground meats, you want to really just mix enough to get a uniform consistency, then shape it using as little pressure as possible. I use my hamburger patty strategy, using barely enough pressure and risking the danger they might fall apart at any moment. Here, I use a large serving spoon to help form them into a football shape. 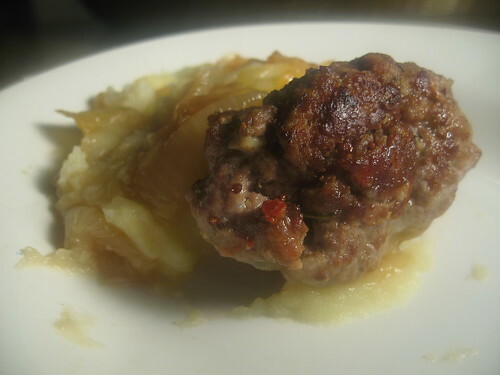 As for cooking, because they are football shaped, the meatballs tend to have three sides to brown. So I recommend browning only two and then letting the meatballs roast. The goal is to be gentle. 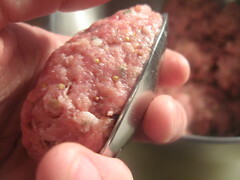 Meatballs will easily dry up and get hard. Remember: Just because it’s hearty and rustic doesn’t mean it doesn’t take care to make. 1. Combine all the ingredients for the meatballs in a large bowl. Mix only enough to bring the mixture together. Make a small patty from the mixture and cook quickly on the stove top. Taste and adjust seasonings accordingly. 2. 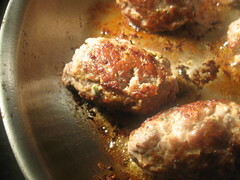 Using a large serving spoon, press the meatballs together in a roughly egg shape. This is an aesthetic choice, feel free to make simple round balls. Place the meatballs on parchment and cover. Refrigerate until ready to use. This can be done a day in advance. 3. Add the olive oil to the pan over high heat. Once it shimmers, add the onions. Salt liberally, then turn down the heat to medium. 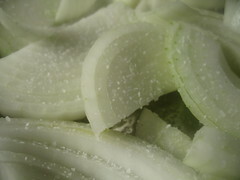 Continue to cook until the onions are soft and golden (30 to 40 min). 4. 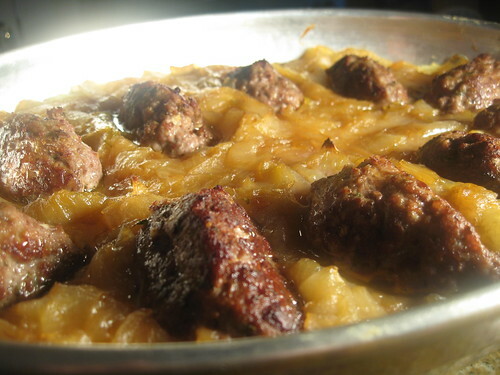 While the onions are caramelizing, peel and cut the potatoes into even large cubes. Add to pot of cold water and place over high heat. Cook until the potatoes are soft. Drain the potatoes and then return to the heated pan. Using a masher or a food mill, combine the potatoes with milk and butter over medium heat. Season with salt and pepper. Do not overmix, or you risk making glue. (This is a basic recipe for mashed potatoes if you hadn’t noticed). 5. Remove the meatballs from the refrigerator. Place a large pan over high heat, add a small amount of olive oil. Gently add the meatballs and brown being careful not to over handle. Remove and place on a paper towel to wick away any excess fat. 6. Preheat the oven to 400F. 7. Assemble, in a large oven safe dish, adding the potatoes as the bottom layer. Smooth them out ensure they’re evenly distributed. Next, the onions in a smooth, even layer. 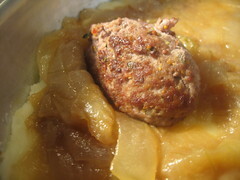 Finally, using a spoon, make small nests for the meatballs, pressing them into the onions and mashed potatoes. If all the ingredients are properly cooled, this can be done a day in advance. 8. Place in the oven, and cook for 30 min. or until the interior temperature of the meatball is cooked. Here in Denmark where I live, Fricadelle (or Frikadelle as we spell it) is a very traditional dish. It is far, far from the dried out un-appatizing things that they like to call Meat balls in the States. 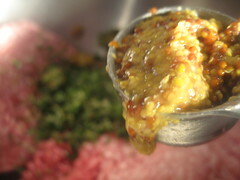 Mix everything and finalize by adding he salt/pepper for taste and consistency (the salt makes the meat go sticky). Fry in real butter on two sides (NEVER deepfry them – it’s a death-sin). 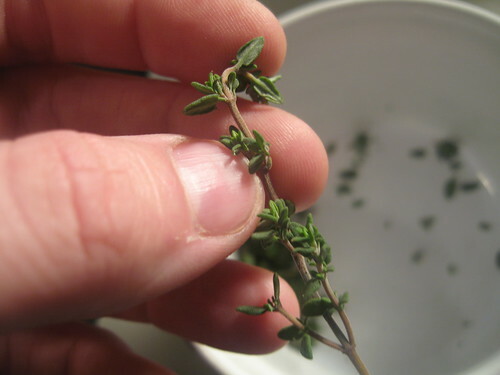 Server them hot with a drizzle of salt and chopped parsley. Oh yessss… on all points. Mashed potatoes – check. 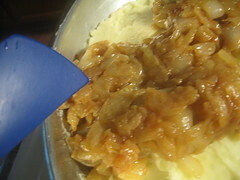 Caramelized onions – check. Meat balls – check. And no disgusting “what’s even IN that?” gravy or processed orange cheese. I can’t wait to share with my husband! Thanks a bunch! I found the images absolutely enticing. Perfect for the family gathering we are having this Christmas Eve. I was just wondering if there is a soy alternative though for my vegan buddies back in college? You seem to know how to make a lot of good tasteful food so I’m asking. Other than that…DELICIOUSO! Excellent and easy to follow recipe. They came out perfectly! oooh… frikadelle with mustard and pomme frites. that’s one of my favorites here in germany. This looks…heavenly. Post reviews at http://tinyurl.com/26okadh ! !